A lot has happened in the last 20 years. Skimming through the pages of the last 169 issues of Hi-Fi+ may not give you a map of the geopolitical landscape of the world (except in the broadest possible terms), but it does give you a very strong idea of just how much – and how little – high-end audio has changed since the end of the last millennium. While not all of those changes are good, we’re possibly in a better place today. 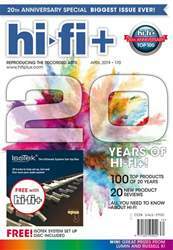 At the end of the 1990s, the hi-fi industry was in a state of flux, and not in a good way. Home cinema was coming to dominate the market so drastically, it was wondered if there would even be a hi-fi industry by the middle of the 2000s! The state of music replay was at a difficult tipping point, too; LP and cassette were dismissed as irrelevancies by the music business, who focused on CD and CD alone. SACD was still a year or so away, high-resolution didn’t exist, and the combination of Napster and the first MP3 players all pointed away from high-quality being a function of future formats. In fact, what happened was transformatory. I remember being invited to a launch by Apple of a new product called the ‘iPod’ – at first, we dismissed the iPod, then we criticised the iPod, and finally we realised we should love the iPod... just as it became the iPhone! Far from being the nail in the coffin of audio, it was a much-needed kick in the pants! Were it not for the iPod and the impetus it created, I suspect the whole downloading and subsequent streaming industry would be several paces behind where it is today. One could even argue that the the vinyl revival was a reaction to the ethereal nature of iTunes-based music. Whatever the reason, though, music is back in fashion and the joy of music and the sound it makes remains an important part of many people’s lives. We’re happy to have seen the changes for the better in audio over the last 20 years, and we hope the same holds true for the next 20 years.